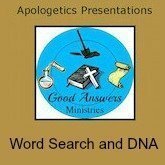 Does God like Word Search DNA? And what does that even MEAN? ?